A new Facebook tool will allow people to pick what posts they want to see first in their news feed. The "see-first" tool for news feeds comes as a minor victory for users who want to wrest control from algorithms and have greater influence over the information they get from social networking sites. The tool, which Facebook discussed Thursday, lets people tell the social networking site what posts they want to see first. The posts can be from friends or from pages belonging to organizations and businesses. The posts will then show up in a person's news feed, with a star in the top right corner to tell users that the person or organization is on their see-first list. Posts picked by Facebook's algorithm to appear in news feeds will come after a person finishes viewing the priority posts. 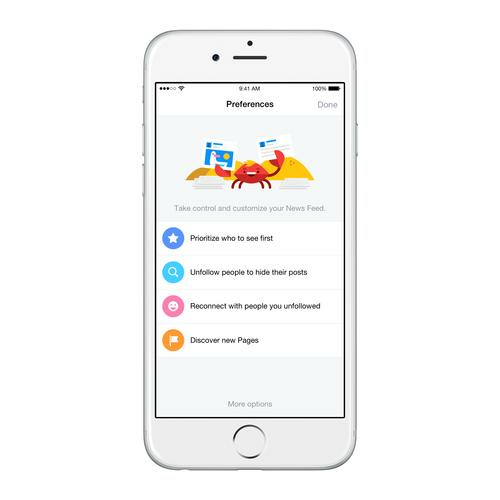 People who use iOS devices have access to the see-first tool starting now, Facebook said, adding that Android devices and desktop browsers will get the feature in the coming weeks. To use the see-first tool, iOS users need to access news feed preferences on Facebook's mobile app. From there, people are shown their friend's profile pictures and tap the friends whose posts should show up first in news feeds. Facebook didn't immediately reply to questions on how the see-first tool will work on Android devices and desktop browsers. Facebook's unfollow feature is also getting a tweak. Users can already unfollow friends and pages to eliminate posts from appearing in news feeds. Now, the site will give users a list of the top people and pages they've seen in their news feed during the week and allow them to select friends to unfollow. And if a person decides to start following a friend again, Facebook wants to make that process easier. The site will now give users a list of all the friends and pages they've unfollowed and, with one click, allow a user to select what people to start following again. The final new feature will suggest pages that a person may want to follow based on pages they've liked previously.